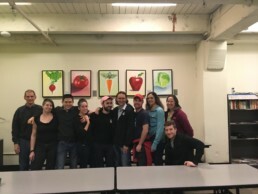 10 BWB Seattle volunteers helped for several hours with meal preparation, working alongside of apprentices and professional chefs in the kitchen to help feed over 2,000 people. FareStart is an organization who decided to tackle society’s most pressing challenges- homelessness, joblessness, poverty, and hunger- through several unique programs in the food industry. Every dollar spent at their restaurants, cafes, or catered events rolled back into their multitude of social programs. Their Rising Higher internships are paid apprenticeships for those struggling to get back on their feet, who in turn get trained as professional chefs who can start their own businesses. FareStart has also partnered up with local farms to ensure a ready supply of the freshest ingredients; not only does this serve as the basis for the gourmet meals at their restaurants, but also the 2,500 quality meals made every day for local schools, healthcare and hospice centers, shelters, and daycares throughout the Puget Sound area. Since 1992 they have prepared over 9 million meals for social service programs and schools. In short, they have directly assisted with consistently funding local farming communities; reducing food waste and transportation costs; providing nutritional meals to 16 different schools and social programs; training youths and adults in the culinary industry, who in turn assist with running and expanding the outreach of the program; and partnering with housing, legal, and mental health organizations to assist with improving the lives of their students. For Thanksgiving, 10 BWB Seattle volunteers helped for several hours with meal preparation, working alongside of apprentices and professional chefs in the kitchen to help feed over 2,000 people. It was a fantastic opportunity that we all enjoyed, and we are looking forward to volunteering with this organization again in the future.